US Secretary of State Rex Tillerson will attend a meeting between Chinese President Xi Jinping and US President Donald Trump April 6–7. Tillerson will skip an April 5–6 meeting of NATO foreign ministers. This is the first time a US secretary of state will miss such a meeting since 2002. It shows that Tillerson views the Trump-Xi meeting as more important than the NATO summit. The Trump-Xi meeting comes amid serious tension between the two countries. This is compounded by issues we’ve written about before such as Trump’s position on China-US trade, security concerns in the South and East China seas, and Trump’s decision to speak directly with the president of Taiwan. Figuring out when and where Trump and Xi would meet likely involved difficult negotiations. These meetings usually do, especially when they are tense and stakes are high. The fact that Xi will go to the US—and especially that he reportedly will go to Trump’s Mar-a-Lago estate in Florida—is one of those minor symbolic victories for Trump. It also indicates that, having agreed to this visit, Xi will be much tougher on substance. To put it in American terms, this is a major league meeting. The NATO meeting, by comparison, is minor league. NATO constantly has meetings. There are few substantive outcomes. NATO meetings used to be of vital importance during the Cold War. Now, those discussions rarely intersect the main issue. The United States, wisely or not, has been fighting a war for 16 years in the Middle East. That war is now entering another phase in Syria with US forces being deployed there. As we’ve said before, NATO as an institution has been of little material support to the US. Many nations provided some support in Afghanistan, but much was symbolic. It was insufficient to have any material effect on the war’s outcome. It is understandable that some NATO members would choose to abstain from this 16-year war in the Middle East. NATO’s charter does not require “out of area” deployments. But NATO is a military alliance. And the organization has been of little value to the US. 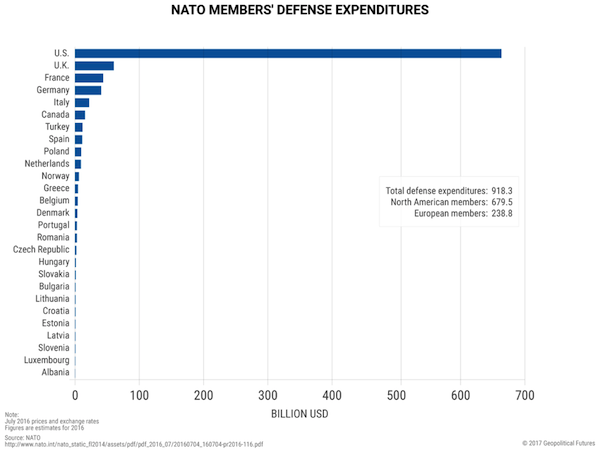 See the defense expenditures of NATO members in relation to the US’. NATO members should not be surprised that the US secretary of state finds a meeting with the Chinese president more significant than a meeting with NATO foreign ministers. Geopolitically, the rotation of interest away from NATO makes perfect sense. Russia is a pale shadow of the Soviet Union, reduced to hacking emails or spreading misleading tweets. There is little to fear in terms of war. Perhaps NATO should be abolished. But for some reason, the Europeans want neither to abolish nor to keep their commitments to the alliance. It is good that Tillerson will not be at this meeting. The American presence would likely make conversation uncomfortable. The Europeans will be there by themselves (with the Canadians, of course). Maybe in private, they can figure out what they think they are doing. Watch George Friedman’s Ground-breaking Documentary, Crisis & Chaos: Are We Moving Toward World War III?